Topics: Buzz Lightyear Toy, Buzz Lightyear Action Figure, Buzz Lightyear Toy Story, Ultimate Buzz Lightyear, and Ultimate Buzz Lightyear Now. Its 2 nameservers are ns2352.hostgator.com, and ns2351.hostgator.com. It is hosted by Theplanet.com Internet Services Inc (Texas, Houston,) using Apache web server. 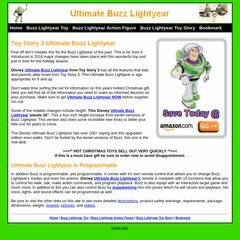 Ultimate-buzz-lightyear.com's IP address is 174.121.33.219. PING (174.121.33.219) 56(84) bytes of data.